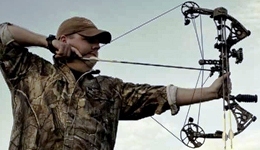 OutdoorChannel.com had the chance to interview hunter, professional archer, husband, and business owner Justin Martin, host of The Season With Justin Martin. Find out what he's been up to, what to expect in future episodes, how he juggles hunting season & life, and how he feels about his Auburn Tiger football team. OUTD - Hi Justin, what have you been up to lately? Justin - I'm out in southwest Kansas, just outside of Dodge City, where we're filming for next year's season. OUTD - Judging from your prior episodes, I'm going to guess you're out bowhunting whitetails? Justin - (laughing) That would be a correct assumption. OUTD - Have you had any luck so far? JUSTIN - Not yet today, this was the third morning, but I've actually gotten some really good ones on film, 10 or 20 yards out of range. Hopefully this afternoon will be the time and we can get the job done and get some good video. OUTD - What have your past few weeks looked like? Have you been on the road a lot? JUSTIN - Been on the road a good bit. I try to stretch things out and plan my trips pretty wisely so I don't have to be gone all the time, because I'm always going to keep family first. I try to schedule my trips wisely - in September I went to Colorado and did a double hunt. I did antelope and elk and carried some extra camera guys and some friends and that way basically we get a part one and a part two show out of that, which we did. We got five really good animals and some incredible footage, and like here in Kansas I've carried 3 camera guys with me. Not only to film myself but two other guys that are good friends of mine that are good on camera and have good stories to tell. So hopefully that'll be a part one and two on that with some outstanding world-class whitetail footage and beautiful scenery and a good story to it. I also went out to Texas a couple weeks ago and got a really nice 10 point. I went up there and got him on the ground, got some real up close and personal, one-of-a-kind footage. This year has been off to a great start. OUTD - What's on the horizon for you as far as trips and episodes? JUSTIN - The next trip I have will be rifle hunting in Kentucky around the 18th and 19th of November. And if I'm able to get through there in a few days, I'm going to go across the river to Illinois to bowhunt there for a couple days. Then I'll come back home for Thanksgiving, and then the first part of December I'll be going back to Illinois to a different location and doing a muzzleloader hunt there. And the day after Christmas I go to Corpus Christy, Texas, to do a duck hunt. That's always a fun time with some really good friends of ours. He's a professional red fisherman and also a duck guide. It's nice to get in the warmer weather, and just have a good time and see more ducks than I've ever seen anywhere else in my life. OUTD - You mention the upcoming holidays… how hard is it to balance your busy career as a homebuilder, your hunting schedule, and your family? JUSTIN - It's definitely tough, but I have a concrete rule that I am not going to be gone on a holiday. I try to schedule things around it. It's, of course, hard to turn down hunts because now I get all sorts of invitations to come hunt places. Everybody wants a little bit of your time, which is great and an honor to be in that position, but it's one of those things where I've got to do what I need to do for my wife and family and everything else around home. As far as the homebuilding, we're still pretty busy in my area of Alabama, even though the recession is still going on. We're outside of a military base that's just booming, and constantly having new guys come in. They go through a helicopter flight training program, which is 2-3 years. They get a good housing allowance every month, so they're always coming in and buying new houses, so we're still staying pretty busy on that stuff. And I have some really good subcontractors, which allows me to feel at ease when I do have to be gone, and as long as I have a cell phone with me, everything is under control. OUTD - You've been in the field quite a bit over the past few months, do you have any great stories or moments to share? JUSTIN - Probably the Colorado trip was the most fun. I've never been antelope hunting in my life. The first morning we're there, I got in the blind, hunting over a water hole, and a monster, huge antelope comes in after we've been there for an hour. I'm able to put a good shot on him, got great video, and it turned out that it was the biggest antelope that was taken on that property for the entire year. Then, we went out two days later and started elk hunting. I had never killed an elk before either - of course, it's hard to kill elk in south Alabama - and not 30 minutes into the hunt, we have an elk bugle. So we get off the horses, get set up, call one time, and he just comes running right in. I was able to put a good shot on him. I turn around and joke to the camera and say, "Hey, I thought elk hunting was supposed to be tough!" I shot a great 6x6 elk, 20-30 minutes into the hunt! Also, I'm breaking in a new camera guy for me. I'm really trying to step things up on the production side, and he's a professional cameraman who has done a lot of different events as a subcontractor, but he's new to the hunting side of things. Colorado was his first trip with me. I was joking with him that he was a city boy and it was definitely an experience for him. But he did a good job behind the camera, and it allowed me to just relax and not worry about what's going on with the camera and have fun. OUTD - Does anyone else in your family hunt? Do you hunt with them? JUSTIN - Let me tell you a funny story. I'm 31, my wife's 28, and we don't have kids yet. We've been married about 3 years and we're thinking about starting a family soon. I don't have any kids, but I do take one of my friend's son hunting. But even cooler to me is my 67-year old mother who took up hunting about 5 years ago. That's been the biggest thrill to me, taking her, whether it's turkey hunting or deer hunting, and seeing her get all excited about a doe walking out in front of us. That's so much fun to me. She has a lot of fun with it, and all of her friends get a kick out seeing her with earrings and make up done and lipstick on, wearing the orange hat, and holding the rifle. It's just a lot of fun. OUTD - I'm sure it's been an enjoyable few months for you as a member of the Auburn football family (Justin was a kicker for the Auburn University football team in the late 1990s) with the success that the Auburn football team has been having so far this season (currently undefeated, BCS ranked #2 and AP ranked #3, and having a Heisman Trophy candidate quarterback in Cam Newton). How great does it feel to be an Auburn football fan this year? JUSTIN - It's been wonderful. We always knew we had a great coaching staff, and then the addition of Cam Newton to the team this past spring, he's been incredible when he comes right out of the gate and is a Heisman contender. It's been a lot of fun to see them progress and hang in there as a team. It's been something we've been really proud of, and I think they're doing a great job and doing it the right way. At Auburn, we are a family and it is a family atmosphere, and we have a lot of pride in the family concept of the university, the alumni, the current players, the athletic department, and the whole nine yards. And that's been one of the fun things I've done this year. Me and Ben Leard, who is one of my good buddies, he was the starting quarterback at Auburn for three years while I was there, and we actually were on the sidelines of the LSU-Auburn game (Auburn won 24-17) last week, and that will be seen on Season Two. Ben is here actually in Kansas hunting with me this week. We're really thankful they've been so open and helpful to allow us to share that part of my background, since it's not just all about hunting. OUTD - Do you have a hard time catching the Auburn games since most of your time is spent in the field? JUSTIN - One funny thing is two Saturdays ago, when Auburn was playing Arkansas (Auburn won 65-43), I had shot a deer in the morning, and we're on the way to the airport to get an early flight. Well the game comes on at 2:30pm so we're trying to rush to the airport to try and see the game, and my buddy Mike actually pulls up the game on his iPhone. So here I am, riding in the rental car, watching the game on the iPhone! So technology is great to be able to keep up with my Auburn Tigers. That Saturday, I was in the treestand looking up on my Blackberry the score and summary and everything else. I don't want to say it was first on my mind, I wanted to see a big buck, but it was definitely high on my list! That was definitely some entertainment to help pass the time. Thank you for your time Justin, we look forward to more great episodes of The Season With Justin Martin, airing Tuesdays at 12pm ET, Saturdays at 8:30pm ET, and Mondays at 2:30am ET!